Our Spanish language school is located in the very centre of one of the most unique and exciting cities in Spain, Granada, with easy access to the region’s ski resorts and beaches. We have been providing high-quality language and cultural courses to foreigners who want to learn Spanish in Granada for over 15 years. Being small and independent means we can offer a truly personal and friendly environment which is ideal when learning a foreign language. We try to provide something different and so pride ourselves on our individual and open approach to teaching. The school is situated in a renovated house at the foot of the Albaicín, the oldest district in Granada. It is equipped with all modern facilities including a computer lab with free wireless access, patio, terrace, television room and a library full of Spanish books, music and films. Communication is the key and our students enjoy the informal nature of classes set to a maximum of 8 meaning that every student can play an integral role in their daily lessons. We have a choice of different types of Spanish language courses to suit your needs which are available for different durations, and with different accommodation options. 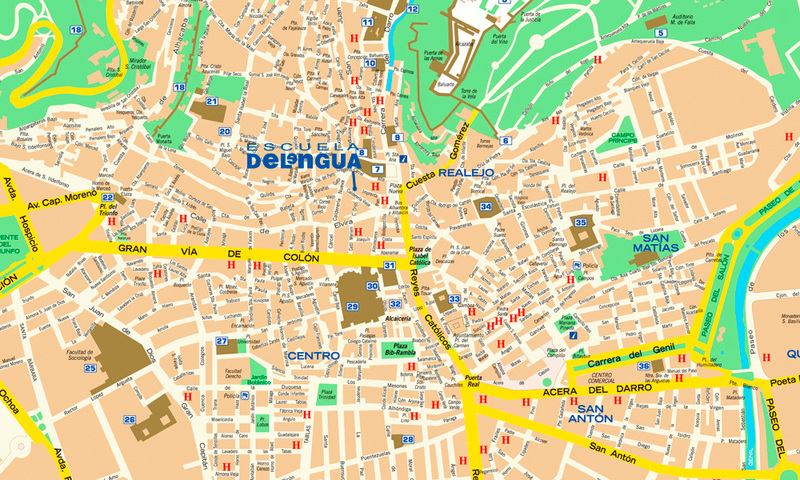 All accommodation is in the centre of Granada no more than a 15 minute walk from the school. We are very selective with the accommodation we provide and always ensure that it is owned by local landlords, is comfortable for all our guests and has a range of modern facilities. Shared accommodation with Spaniards: single and double rooms are available. People travelling alone need to reserve an individual room. You can stay here, provided you are staying longer than six weeks. It offers the perfect opportunity to improve your Spanish. Students share a kitchen, bathroom and communal areas. All bed linen is provided but towels are not. Shared accommodation with other students: single and double rooms are available. All apartments have communal kitchens, bathrooms and sitting rooms. You stay with other international students from the school meaning you can practise Spanish together. All bed linen is provided but towels are not. Stay with a Spanish family: you can book a single or double room half-board (breakfast and one meal). The families are carefully selected by us and have experience hosting foreign students. This accommodation offers the perfect opportunity to experience Spanish life, practise your Spanish and helps the local community. Hostel/Hotel/Guest House: the school can suggest places for you to stay that are comfortable and close to the school. - Trips to the Alhambra and Generalife, Granada Cathedral, the Cartuja, the Royal Chapel, Sacromonte Abbey and the Albayzín. - Typical Spanish parties and meals. - Visits to the cinema, theatre and Flamenco shows. - Trips to guitar builders and potters. We value our role within the community and regularly attend neighbourhood meeting where we help with decision making. We encourage all of our students who come to learn Spanish in Granada to use the local shops and stalls close to the school so that they can get a feel for the history and culture of the city and so that they can support local business. All our teachers are employed from the local area and the accommodation provided, within walking distance from the school, is owned by local landlords or families. We ensure that the accommodation places our students in the centre of the community and that they will play a part in typical Spanish life. We do not charge for the organisation or administration of activities, students only have to pay the entrance fees when at the particular place of interest. Therefore the money from our students goes directly to local businesses, guides and the attractions here in Granada. We work with charities that help teenagers and young immigrants who have recently arrived in Spain with basic or no knowledge of Spanish. We provide them with teaching materials and support to help these people with their Spanish studies. This is important for us as we can use our main forte to help those in need. We have written a Code of Conduct for all of our students and teachers. They can refer to this during their stay with us and again when travelling in the future. The Code specifies how you can be responsible and environmentally sustainable. We believe that if our students do at least one thing that is included in the Code then we should make a difference. from the teacher very frequently throughout the class. The learning environment was hardly something which one could recreate for themselves at home and provided an enormous boost to my overall proficiency in the language, so great value for money I'd say and very good fun too. It definitely benefited local business - so yes on that front. I flew to Granada from London - less good for the environment. Conservation - don't see how that applies here. teachers. Magical, great teachers, loved classes, learned a lot! no one else was staying there. Very basic and on 3rd floor with no elevator. If you really want to enhance your class, I would also book private lesson. Peggy! It's been a pleasure having you here. Thank you so much for your review and for your suggestions, that always make us improve to offer better services to our students. Regarding the accommodation, you were the only one in your flat because you booked a private apartment, that's why. Maybe you didn't realize it while filling in the form! We also offer rooms in shared flat, this means that a student will share the accommodation with other people. So, next time you can choose "single room in a shared flat" if you prefer to live with other people. Thank you for being part of our family and hope to see you soon! Stepping out on the terrace and facing the magnificence of the Al Hambra Palaces in the sunshine. It’s one of those wonderful places you spend your whole life gazing at in pictures, but when you see it for yourself it is far more than any picture can portray. Attending the school every morning gave structure to the week and the staff were most helpful in their advice, maps, directions and so on.